Once again, the annual United Nations General Assembly is taking place in New York City with U.S. President Donald Trump set to take center stage as he is expected to focus on the North Korean Crisis and the 2015 Iran Nuclear Deal also known as the Joint Comprehensive Plan of Action (JCPOA). However, Netanyahu wants the 2015 Iran nuclear deal to be amended or canceled. “Our position is straightforward. This is a bad deal. Either fix it — or cancel it. This is Israel’s position,” said Netanyahu in Buenos Aires” the report said. According to Amos, Netanyahu did not act before now because former US President Barack Obama was not an appropriate partner. “Thankfully, today we have a supportive government which understands the threat very well, especially in light of what is happening with North Korea. We can’t let this opportunity deteriorate into simple rhetoric, we need to make a general strategy. We need to fight Iran determinedly in every way, including those not included in the Iran deal, such as ballistic missiles, Iran’s support of terror, and their involvement in Syria. We also need to strengthen our supervision of them and collect better intelligence. Israel wants Iran destabilized just like its neighbor, Iraq to weaken its political and economic standing in the Middle East. Iran’s allies are Hezbollah and Syria, enemies to both Israel and Saudi Arabia. 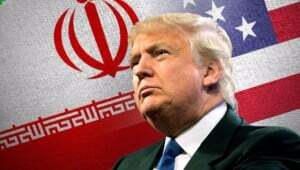 Iran is an economic and military power which can challenge the U.S. and Israel’s hegemonic power in the region. Netanyahu is trying to influence Trump’s decision to terminate the nuclear deal, which would put the U.S. on the fast track to war with Iran. Netanyahu would welcome an attack on Iran by U.S. forces which would free Israel’s military and allow it to focus on Hezbollah and possibly Syria in the next conflict with help from Saudi Arabia. It’s been a long-term goal of Washington’s political establishment and Netanyahu to realign the Middle East in Israel’s favor. With Trump in the White House, the Israeli’s see an opportunity while the rest of the world sees pure madness. This article was originally published by Silent Crow News where the featured image was sourced.